Windward Islands left-arm spinner Garey Mathurin has been included in the West Indies Twenty20 squad against England in place of offspinner Ashley Nurse, who did not meet the required fitness standard at a preparatory camp in Barbados. Mathurin, 27, has played 11 first-class games, picking up 40 wickets at 22.15 and 12 T20 games, collecting 10 wickets at 24.50 with an impressive economy rate of 5.56. He has best figures of 7 for 72 against the England Lions, followed by 5 for 86 against Leeward Islands the very next game this season. "I see this as an opportunity given to me to represent the people of the Caribbean and I'm looking to have a good tour," Mathurin said. "I'm looking forward to fitting into the new environment and working with the coach and the other members of the team. I'm a confident person and a confident cricketer so I always keep a positive outlook. "In T20 cricket it's all about looking to get runs as quickly as possible so the aim of the bowler is to keep the batsmen in check and restrict the scoring. My main asset is my ability to keep it tight and build pressure on the batsmen. I see this as my job in the team. Also, I know I have to contribute with the bat and I'm always looking to see what I can do to contribute to the team." 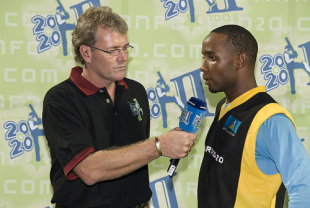 Mathurin is the third St Lucian to be picked in the West Indies national team, after Johnson Charles and Darren Sammy. "I have known Darren for a very long time, we played together at the Under-19 level and the senior level for St Lucia and Windwards and we talk a lot about the game, so it's special for me that I get to play for West Indies with him as the captain." West Indies play two Twenty20 internationals in England, on September 23 and 25, and have selected a young side, with many seniors unavailable due to their participation in the Champions League Twenty20.